In Regency England Mrs Thorne’s School for Young Ladies is about to close due to the death of young Clarissa’s mother a year ago.This leaves eighteen-year-old Clarissa Thorne and her three school mistress friends no option but to return to the bosom of their families as despised ‘poor relations’ – at everyone’s beck and call for all their lives. 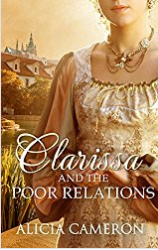 But Clarissa has just inherited Ashcroft , a large crumbling estate, and she offers her companions an escape – run away with her to a life of independence and adventure. They must put the estate to rights with little money and less experience. Can sensible Miss Micklethwaite, aging romantic Miss Appleby and the beautiful Miss Oriana Petersham escape their fate? To keep the vivacious, impulsive Clarissa in check they must at least try. However, their relatives may have other plans. This book is bargain priced from 02/21/2017 until 02/26/2017.